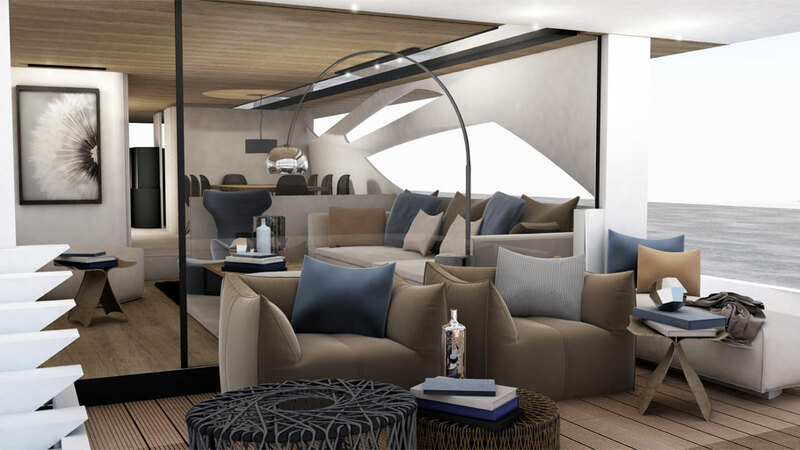 Our review of the 8th Architecture and Interior Design Awards finalist’s projects takes us across the seas on board a luxury and very cosy vessel designed by Giorgia Giacuzzo: The New Rodman Muse 74. 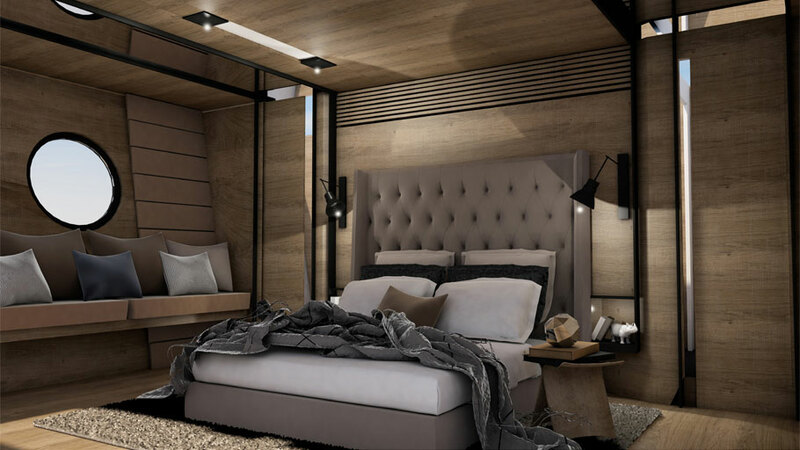 This yacht prototype, finalist in the Professional Forward-looking Projects category, turns out to be modern as well as classical, and at the same time it is able to make any sailor dream thanks to the excellent interior design conjunction of the PORCELANOSA Grupo materials and products. Giorgia Giacuzzo, a member of the MHN Design Union PTY LTD studio in Sydney, Australia, came up with the concept of both an avant-garde and comfortable yacht. 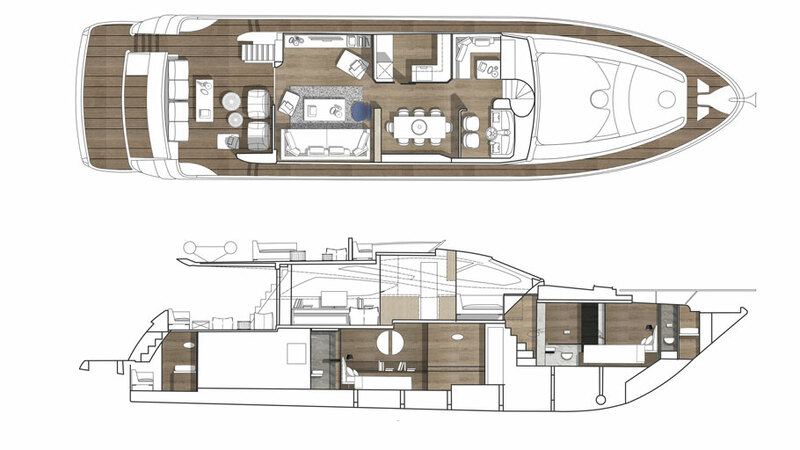 The idea was about appealing to luxury but achieving a degree of cosiness and warmth, by means of the use of wood in floor tiles and wall tiles in most of the yacht’s design. Nevertheless, there is a combination of the use of ceramic parquet in some of the rooms, together with the application of natural wood in the exteriors, to be precise, the Styledeck Plus Brown laminate flooring by L’Antic Colonial, which ensures quality and durability, thus, resulting in beingideal for boat decks. With a highly natural and at the same time intoxicating wooden appearance, the ceramic parquet is present in floors, ceilings and walls in the rooms, bathrooms and corridors. The sumptuous PAR-KER series which has been used in this ambitious project, is Ascot-Olivo, a porcelain tile with a wooden appearance by Porcelanosa which is able to captivate and seduce. 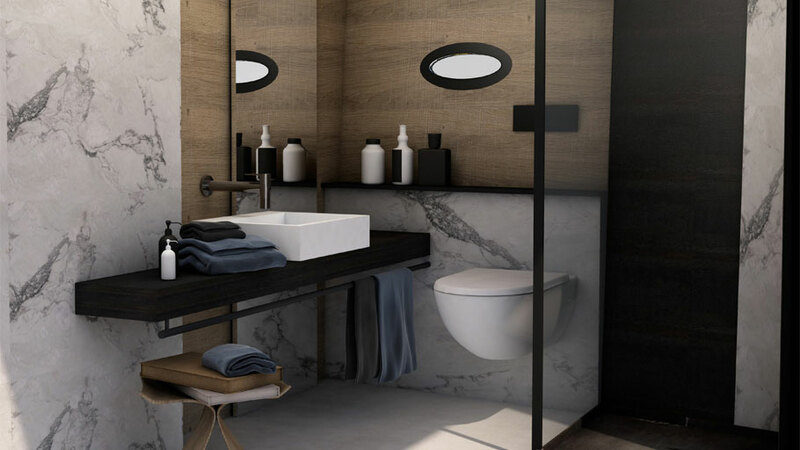 As far as bathrooms are concerned, several PORCELANOSA Grupo materials are intermingled in order to tile one of the most demanding spaces regarding the New Rodman Muse 74 project. 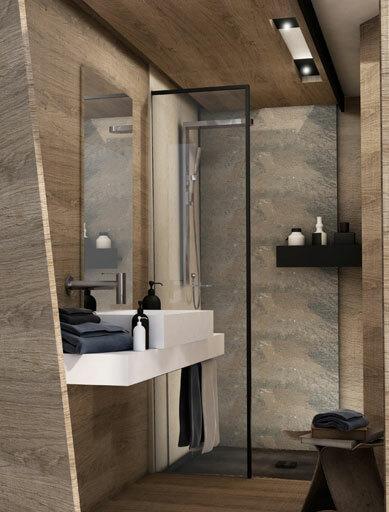 Because of its highly resistant, easy-cleaning and anti-humidity properties, the through-body porcelain by Urbatek has been the selected material in its multiple versions, by combining both a cement and marble appearance finish in the bathroom design. 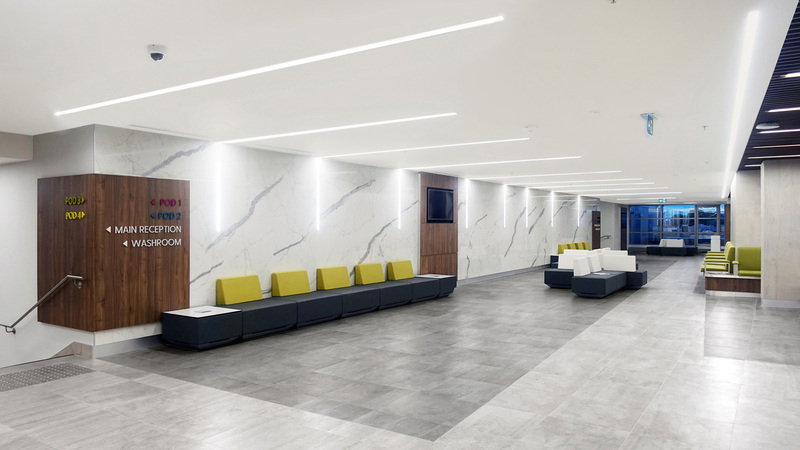 With the aim of providing the classicism of the marble appearance, the NVY XLight porcelain tile has been the choice, whereas, the cement finish is provided by the full-body porcelain tiles, such as the Concrete Timber Black Nature and Concrete Timber Grey Nature series. With regard to the bathrooms interior design, the installation of the STON-KER porcelain tiles has been the choice, in its Arizona-Caliza and Arizona-Arena series, both of them by Porcelanosa, a ceramic stone which offers both sophistication and high resistance. The bathroom equipment is by Noken, by means of its sanitarywares, whereas Gamadecor again dominates the role of the kitchen furniture. In fact, Giorgia Giacuzzo has made the choice of different designs, such as the 2.30 earthy texture and textured white kitchen furniture, as well as the KRION ® Solid Surface Dreams table, a design combining aluminium with the state-of-the-art acrylic stone. A yacht project, where crossing the deepest and narrowest seas may become a warm and comfortable luxury.